Who needs a line of coke when you can get three hours of Foo? Seriously, if I was a licensed therapist I’d prescribe to any of my depressive patients one night with the Foo Fighters and have them call me in the morning. Foo Fighters in all their glory stopped in Portland on Monday at the filled-to-the-rafters Moda Center for their on-going Concrete and Gold tour. They hit the road last year visiting smaller venues like the Matthew Knight Arena in Eugene, OR, large stadiums like Fenway Park in Boston, MA and the usual stops like those at the nearly 20,000 seat Moda Center. Same band, same tour. See them small, see them large. They offer it. But that’s not all. $25 concert shirts? The last time tour shirts were selling for $25 Rush still had more than half their career left. So I got one. Oh right, what about the songs? Twenty-one of them and some morsels in between. All served with whip cream and a cherry on top. Foo Fighters opened with “All My Life” off 2002’s One By One and tore through the first 10 songs with precision, gusto and glare. 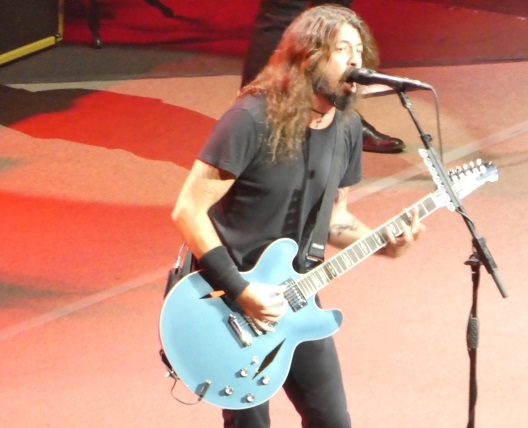 The night belonged to sole founder, singer and guitarist Dave Grohl. Doesn’t it always? But he has no trouble passing the torch. Drummer Taylor Hawkins got his chance to shine with a three minute drum solo. Lead guitarist Chris Shiflett sang Alice Cooper’s “Under My Wheels”, his choice during the band introductions, while Hawkins who took primary vocal duties on “Sunday Rain” off the new album Concrete and Gold showed his prowess on the Queen cover “Under Pressure” while Grohl took over on drums. And can that man scream. All night long. Every song. Even at the audience. He’s crazy. He’s nuts. He’s near maniacal. But you wouldn’t want it any other way. It can’t be any other way. It’s all part of the Foo Fighters package wrapped up in a Dave Grohl bow. It took more than two hours to finally grow a frog in his throat which impacted “Best of You” a bit. He doesn’t have to scream. Remember his first band before Nirvana was called Scream, so, I guess he has to. However, “These Days .” See Dave, a nice soft vocal exists somewhere in there. The band introductions took a bit of time – too much time – coming in around 25 minutes but Grohl kept it fun as he and the rest of the band turned screwing around into an art form and played snippets of others’ material like the Ramones’ “Blitzkrieg Bop” Queen’s “Another One Bites the Dust” and an almost hilarious “Jump,” Van Halen’s hit song. Oh, and Grohl said they were going to play a song from every album. You forgot Sonic Highways ! 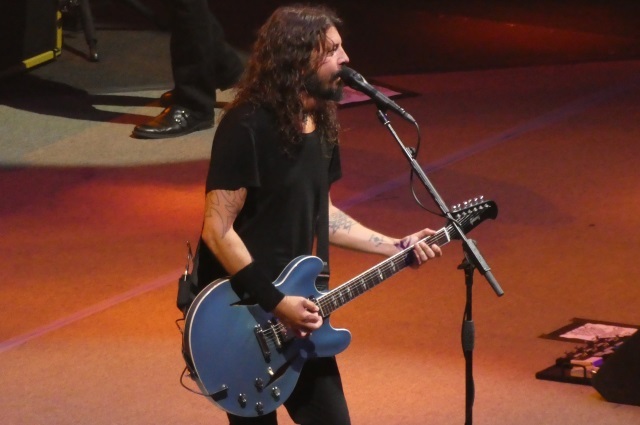 After the “break” (really that’s what it was) Foo Fighters continued with all the hits checking the box on “Monkey Wrench,” “Run” and “Breakout.” They returned for a four song encore three of them covers. And despite the inordinate amount of covers (yes, I’d prefer to hear Foo Fighters songs at a Foo Fighters concert – they also forgot to play something off the eponymous debut album ) the band raises those to another level too. You ever hear the lyrics to Van Halen’s “Jump” sang to the melody of John Lennon’s “Imagine”? Well Foo Fighters pulled that off. Tom Petty’s “Breakdown” was totally Foo’d up and that Queen song from Hawkins – kind of made the actual Queen song sound a bit limp. 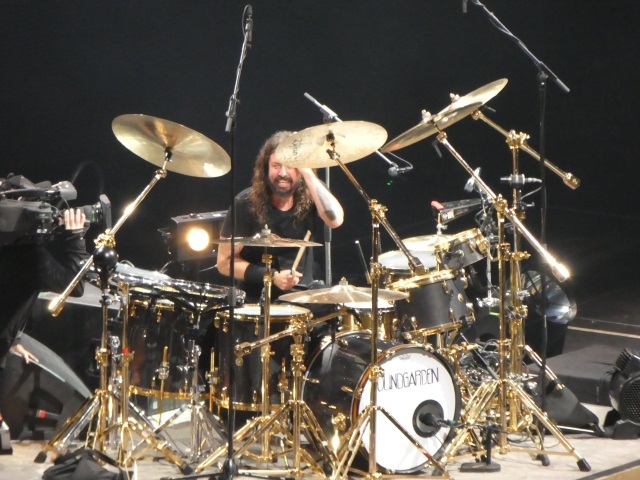 When Grohl wasn’t yelling at the mic the band added extra flair to just about every song taking them and the audience on a rock and roll journey that featured lengthened solos, extended jams and free play that almost served as songs within songs. “All My Life” was brash, “The Pretender” was simply balls-out, “Run” was every bit as vigor and melodic as the album version, the band summoned 70s Rush while extending “Best of You” and “Breakout” probably broke 10 minutes in length. I think a few more were that long too thanks to all the improvising and instrumentation. Grohl arrives rife with energy and completely contagious. Not only to the rest of the band but the audience as well. 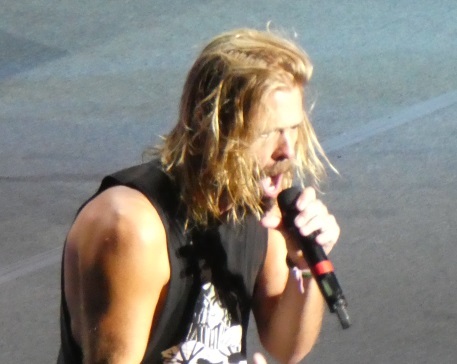 He ran on stage to start the show – none of this last minute appearance to great applause – encouraging the audience and in many respects announcing “We’re here!” Foo Fighters were thoroughly present this night giving fans a night to remember and what can only be described as a pure, unadulterated rock concert. It was loud – maybe too loud – and the driving guitars brought classic rock DNA from a modern rock band. Foo Fighters ended the evening with the popular and fan and radio favorite “Everlong,” but wait. No “Times like These?” The #1 best Foo Fighters song according to this influential website. And no “La Dee Da.” That would have been fun. Great writeup! Nice to see Tour Shirts at a decent price! I payed $50 Canadian for an Alice Cooper Tour tee two weeks ago which would be $40 U.S.
Glad u enjoyed the show! 25 bucks in todays concert market is a steal! ok ok I’ll play along ..